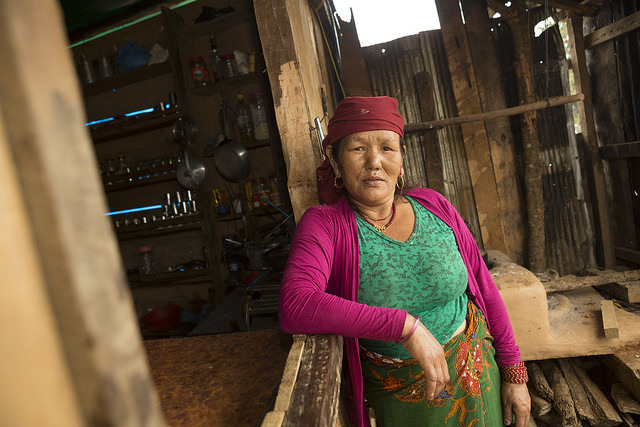 The earthquake that devastated communities in central Nepal on April 25, 2016, not only turned Kumari Gurgung’s home in Hansapur to rubble, but destroyed her business too. Her granddaughter and the entire family survived, although thousands of other families in the region still mourn their loved ones. Along with the staggering loss of life, the earthquake destroyed 500,000 homes and businesses. Kumari had depended on the hotel for 14 years. Now everything was precarious. But Caritas member organisation Catholic Relief Services was there to help her with both immediate relief and rebuilding her business. Kumari, her son and daughter-in-law rent these plywood and metal-sheet rooms for a little less than $2 a night. Although they also earn income from selling home-cooked meals and snacks, and from Kumari’s knitting and weaving, the Gurungs still don’t have enough income to build a permanent hotel. And the family still owes money on the loan they took out to construct their hotel that was destroyed in the earthquake. They have borrowed as much as possible using family jewelry as collateral, but they need more cash to rebuild. It’s the same for many of the business owners in the market of Hansapur, a trading enclave tucked in the foothills of Mount Manaslu, more than 26,000 feet high, in the Himalayas. Although the town is small, it’s the heart of trade and resources for the smaller villages connected to Hansapur. Business is back, especially for families who trade in construction materials, but it’s slow. Many families have not been able to begin construction on permanent homes. Kumari estimates it will take another 5 years for the market to reach its pre-earthquake level of economic activity. 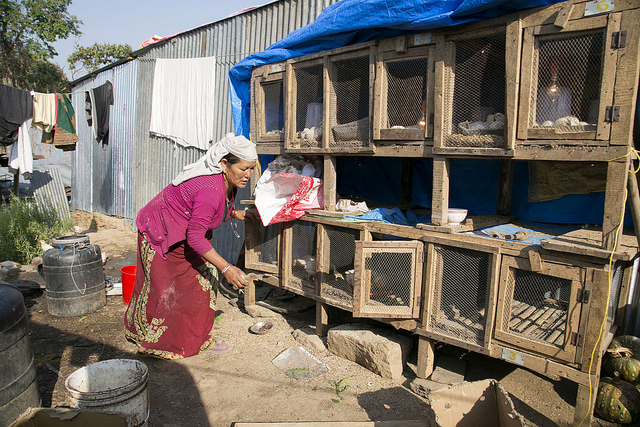 “In the first weeks and months after the earthquake, we knew how critical it was to get central markets operating again,” says Lorraine Bramwell, CRS country representative for Nepal. “Here in Hansapur, we are 5 hours away from the main market in Gorkha. So if this market did not quickly recover, it wouldn’t be only the shop owners who would suffer, but also the communities living in surrounding rural areas who depend on this market, and who would otherwise have to travel for days to get any goods or supplies. Even though their business is slower than before the earthquake, Kumari has big plans for building a new permanent hotel. She is facing strong competition from many other families who built extra rooms into their shelters to rent to travelers. But with years of experience in hotel management she says she has the key ingredient for attracting business: careful attention to hospitality. “I laugh and talk with my guests. I call them to stay and welcome them. I provide tea and good meals. That’s how I get repeat customers,” she says. As she has gotten older, Kumari has turned over most of the hotel operations to her son Mohan and his wife, Bindhu. Kumari focuses on work that lets her sit more often, like cooking sweets and weaving bags and knitting clothes to sell. Their income is enough to keep the family fed and the children in school—and to keep her hopes alive for rebuilding the family’s assets for the next generation.